Homemade Buttermilk Caramel Sauce is Rich, thick and delicious. This sticky, buttery sauce uses real butter and buttermilk. The flavor is outstanding! You won’t buy syrup for ice cream, desserts or pancakes after tasting this delectable sauce! You can make this lovely sauce easily with a few ingredients at home! Add amazing richness and flavor to your Buttermilk pancakes, sweet quick breads, muffins, pies, and ice cream. Pour it over cookies, cheesecakes, or cupcakes. So many uses for a good sweet sauce like this one! Like it salted? Drizzle it over frosting like Kayti Did for several of her cupcakes and sprinkle on the sea salt! Go for it! If you need a thicker, more spreadable caramel sauce, try Inger’s single Ingredient Caramel Spread. so yummy and it’s fantastic in Banoffee Pie! I decided to use Homemade Buttermilk Caramel sauce in my Caramel Pecan Banana Date bread recipe. 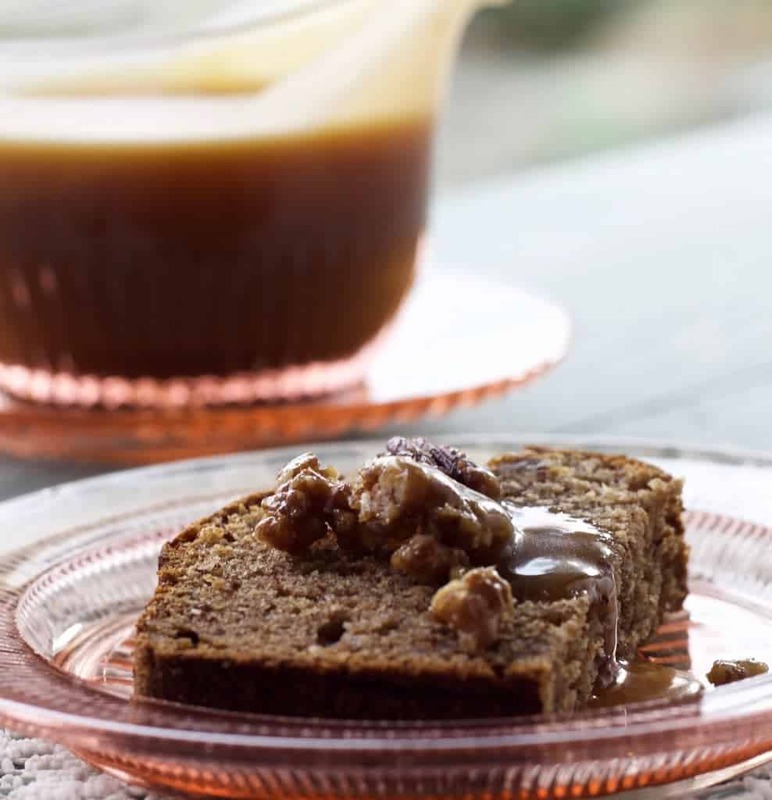 This Caramel sauce over the top brings a simple banana bread recipe up to delicious dessert! In the past, I rarely bought Caramel sauce from the store. It’s sat in my fridge forever. Until it finally got so crusty I threw it out. Thats because store bought is full of nasty ingredients I can’t pronounce. The store bought sauce is almost certainly devoid of all nutrients, other than sugar. I can’t justify it for the calories it adds to my diet. It also has an off chemical taste, somewhat masked by all the sugar added into the store brands. I gave up store brand processed bakery items years ago for the same reason. Also store bought ice cream. Those items VERY rarely make an appearance in my kitchen anymore. Way Too Dangerous for our health and waist lines! Homemade Buttermilk Caramel Sauce is so buttery, and rich. The flavor is amazing! Homemade with real wholesome ingredients is where it is at! Even for ‘junk food’! This sauce is a great example of the improvement in the quality of our food. Making it myself with good quality ingredients gives us a much healthier diet! I’m enjoying making my own ice cream too! The Truly amazing thing is…homemade food with real ingredients, does NOT make me fat! I’m pretty sure the reason is that homemade goodies do NOT have the additives that make us addicted to our food. The processed food industry does purposefully and with full FDA approval put horrid, addicting additives into our processed foods. I walked off that train years ago. I hope you’ll follow me down the homemade track. For the health of your family; unchain your taste buds from the processed foods and make it yourself. You won’t be sorry! I encourage you to use real, natural buttermilk. Real buttery buttermilk made from Guernsey Cows is amazingly flavorful and so good for you. Putting vinegar in your milk (like I used to do) is not even close to the excellent flavor a truly good buttermilk can give you! Same thing with the butter. Use real organic butter! Do NOT use a small pot for this recipe! It will boil up more than you think! A soup pot is a very good idea! This is a very easy recipe. Just follow the directions and enjoy! stir another 8 or so minutes until the caramel turns deep golden brown and slightly transparent. It will be foamy. Remove from heat, stir in the vanilla and let cool. The foam will form a skin on top. Remove that foamy skin for best(prettiest syrup). Eat the foam on toast! I made this for the coffee cupcakes and it was SO good. Creamy, drizzled perfectly. I made a half batch today and for some reason after it cooled it got all granular and chunky and I’m not sure why. It was creamy before when it was still warm. Any thoughts? Hi Rachel, I’m so happy you loved this sauce on your cupcakes. I’m sorry your second batch did not turn out for you. Try doing a full batch again and following the directions precisely. I have noticed sweet sticky sauces like this one are tricky to get right when the measurements change. It sounds like you over cooked it and that makes sense for this smaller volume.I’m sure it overheated. That would cause the results you describe. I hope that helps and thank you for reaching out with your question. Hi, and thank you for the recipe! It’s fantastic! I’m wondering how you store this sauce? I’s it safe left on the counter, or do you keep it in the fridge? Hi Sara, I’m so glad you’re enjoying this caramel sauce recipe. I stored it covered in the fridge in an airtight container. It will last several days if you keep air out of the container. Enjoy and have a great day! Is there a way to get around the corn syrup? You can omit the corn syrup and still get a caramel sauce. I would love to know if you enjoy the syrup that way. I’m sure you are not alone in looking for a beautiful rich result without corn syrup. I found this link for you. This is good post that includes some information about the science in making caramel sauce. Good luck and let us know your results! Remember she is not using buttermilk. Hers is a very different recipe so I can’t say the results will be as good. would this recipe work if I wanted to seal the jars to use for future gifts? Home canning chocolate and caramel sauces is not recommended by the USDA. They are both very low acid content and therefore unsafe to can. That said: Go ahead and make this sauce for gifts. It will be stunning in a gift baskets or by itself and well loved. I found this link for you on ChowHound.com. This is a discussion of this issue. Caramel sauce will keep for ages in the fridge. Just put a tag on the jar that tells them to store in it the fridge. This is a great gift idea! Good luck! Best caramel sauce ever! Love it on bread pudding and cheesecake and on a spoon! Hi Kathy, Thank you so much for taking the time to tell us you love our Homemade Buttermilk Caramel Sauce! You made my day!